Anyone uncertain of just how quickly a hockey puck can travel around a rink need look no further than the closing seconds of last night's Rangers game: With five seconds remaining and the Rangers down by a goal, they dug the puck out of a scramble along the boards and directed a weak shot toward Martin Brodeur. The Devils goaltender controlled the puck and left his crease to swing the puck behind the net and around the opposite boards with roughly 3.8 seconds left. With 1.5 seconds to go, Dan Girardi stopped the puck along those boards and fired the puck toward the slot. Half a second later, Brandon Dubinsky deflected the puck past Brodeur, and with 0.08 seconds left, the puck rang off the post, ending the game. In less than five seconds, the puck had pinballed from one side of the offensive zone, toward the goal, around the net to the other side of the zone, and back at the goal. 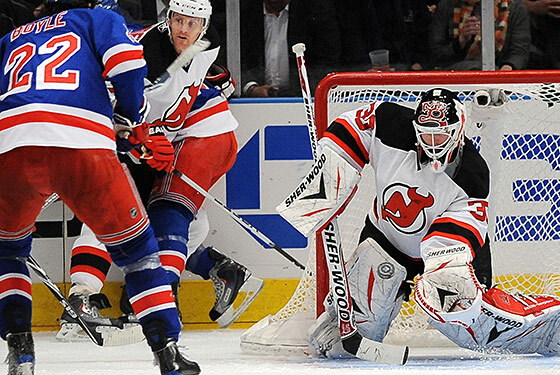 Which is a long-winded way of saying: Despite an exciting finish, the Rangers lost to the Devils last night, 3–2. Perhaps it's only fitting on a night in which the Rangers couldn't convert on a handful of chances from in and around Brodeur's crease — Dubinsky had hit iron earlier in the game, as well — that the game would end on such an opportunity. But the bigger concern last night was that Henrik Lundqvist wasn't sharp, allowing three goals on just twelve shots before being pulled in favor of Martin Biron. Hank's new BFF Justin Bieber surely disapproves. The Devils looked more like the neutral-zone-defending team of their heyday than the bottom-dwellers the Rangers had encountered earlier in the year, and yet still, had the Rangers power play been more effective, it's possible we're not discussing last-gasp deflections today. Vinny Prospal scored a power play goal in his return — early in the third with a two-man advantage to cut the lead to 3–2. But not 30 seconds later, Michael Del Zotto — again playing instead of Steve Eminger — took a tripping penalty of his own, canceling out the remaining power-play time and killing whatever momentum they might have been building. On the night, the Rangers would score just the one goal in six power-play opportunities, four of which came in the final period. They've made a habit out of rallying in the third period this year, but last night, they dug too deep a hole. And as pleasing as it is to watch a team battle hard in third period, not digging those holes to begin with will make life a lot easier in the stretch run.